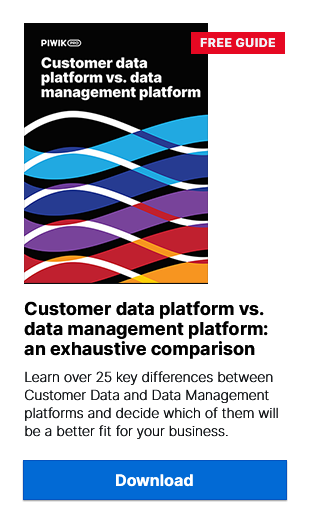 Data Management Platform, Customer Data Platform – their names may sound similar, but are they really the same thing? Let us guide you through the key differences between a DMP and a CDP. This let them use data to create detailed audience segments and push it to other platforms like DSPs and SSPs, spreading the word about their products & services to audiences (or to put it more accurately – segments of people) who’d be truly interested in them. Or simply sell all the acquired information to a third party and benefit from a quick profit. However, since 2013, when the term customer data platform was first coined by David Raab (who is considered the father of this technology), CDPs have become popular data management software. They are recognized as a great alternative to DMPs, for many reasons we’re going to address later in this post. We feel that this type of comparison, although useful, can cause confusion and blurs what are important differences. Of course, various platforms have some thematic overlaps, since both of them are helpful for marketers and are designed to provide customer insights. But that doesn’t make them the same thing. That’s why we’ve prepared a list of the most important differences between a DMP and a CDP. We hope that it will help you understand the key features of the two platforms, as well as aid you in deciding which solution is most suitable for your needs. That may seem like a no-brainer. We think, however, that without explaining some of the basics, we can’t go on and discuss things at a more advanced level. Furthermore, the reason why certain data management software was created significantly affects many aspects of how it works and what you can achieve using it. So let us explain the basic assumptions of both technologies. DMPs were originally designed around one channel: ad networks. The technology collects data from various sources (like the ones described above), classifies and categorizes it. It then puts the data into different segments, and next uses these segments to achieve certain goals. They also serve as data warehouses for marketers and advertisers. CDPs, on the other hand, were primarily thought to be a system of records for managing disparate data about the real customers across a company’s MarTech tools (that’s why the word “customer” is in the name). This means that the CDP gathers and unifies customer data from multiple sources, such as: analytics data from your websites and apps, CRM data, backend and/or transactional systems (including offline ones! ), etc. Then the data can be further used across multiple communication and marketing channels, for instance to personalize website content and prepare customized emails, dedicated offers, and discounts. CDPs help improve conversion rates, customer retention and engagement with clients, and they are utilized by every department involved in dealing with customers. This includes not only marketers, but also store managers, manufacturers, and many others. In layman’s terms: It’s safe to assume that a DMP is more of an AdTech platform, while a CDP can be considered a MarTech tool. DMPs were designed primarily to target and retarget anonymous users visiting your websites. CDPs, on the other hand, aim to create an exhaustive database about your real customers that you can use in a variety of ways, not only for advertising. One of the most important differences between the two platforms is their approach to data anonymity. A quick reminder – what is first-, second- and third-party data? First-party data is the most valuable kind of information since it’s collected directly from your users/customers. Because of the direct relationship with your users (who are also your customers), you can create user profiles based on information about real people interacting with your website and app. This kind of data is acquired from a range of different sources and then sold to you by a third party. It’s considered the least valuable, and raises the largest number of privacy concerns. However, it’s still used by marketers who don’t have access to first- or second-party data, but want to target their desired audience in their online campaigns. As we said before, DMPs were created mainly for advertising purposes, with anonymity as one of the most important features they had to provide. Because they enabled exchanging information about audiences between publishers and advertisers, they had to do this without raising data privacy concerns. That’s the reason why a DMP operates mostly on third-party data – the kind of information often stripped from common identifiers (containing personally identifiable information). This means it’s easily shared between parties without putting anyone’s legal compliance at risk. To avoid the struggles involved in dealing with PII (or ‘personal data’), DMPs operate on anonymous data. They simply don’t need to know who you really are to present online ads based on the websites you’ve visited before. In the case of CDPs, things look a bit different. As we’ve said before, this technology works primarily on first-party data about real customers. and as long as you handle it in compliance with data privacy laws, you’re covered from the legal standpoint. Important outtake: DMPs work primarily on anonymous third-party data, while CDPs in most cases operate on first-party data gathered from known users and customers. Bear in mind that both platforms can also digest different kinds of data. DMPs can work on first-party data, while CDPs accept information collected from third parties. However, in this article, we aim to present the most popular applications of these technologies. User profiles are also differentiating factors between DMPs and CDPs. In the case of a DMP, user profiles are temporary and typically expire after 90 days (this depends on the lifespan of a given cookie), so the technology focuses more on segments and categories than user-level data or single user-views. What’s more, since the data pushed into the platform is anonymous, most DMPs build segments and match data based on the so-called probabilistic method. To put it concisely – the algorithm “guesses” the links between certain pieces of information, as it doesn’t have access to known user identifiers that would allow it to determine if the data comes from one person. You can read more about it here. With CDPs, the most common way to match users (or customers) together is by using email addresses. Because a person’s email address is unique to them, they can be identified and matched across a wide range of data sets. This method is called deterministic matching and gives much greater accuracy (around 80-90%). The high accuracy of profile matching means CDPs can create an evolving database of user profiles progressively enriched as people continue to engage with the brand. This profiles are called a single customer view – a 360-degree representation of all the aggregated data a company knows about its customers, often deemed a holy grail of every marketer. If you want to read more single customer view, we advise you to visit this blog post: Single Customer View: What is it and How Does it Work? With a DMP, the service provided by the platform consists of combining your anonymous web analytics data with third-party data taken from different vendors. This means that you’re paying for the ability to target prebuilt segments with your online ads and retargeting campaigns. In the case of CDPs, the platform assists you in collecting and handling your user and customer data. It helps you make sense of all the disparate data coming from various places, create audience segments, as well as sync those audiences with every marketing tool in your stack. Also, it allows you to create a formerly mentioned single customer view. And that’s the reason many companies decide to invest in CPDs. If you want to learn more about capabilities of customer data platform, we advise you to visit this blog post: Customer Data Platform: What is it and How Does It Work? Which data management software will be the right choice for you? As you can see from the examples presented above, although data management platforms (DMPs) and customer data platforms (CDPs) have many things in common, there are also many factors that make these data management tools very different. One of the most important is their approach to data anonymity and the types of data they operate on. So if you want to handle third-party data from outside vendors, a DMP might be a better fit in your case. But if you’d rather put your first-party data to work, a CDP would be a better choice for you.